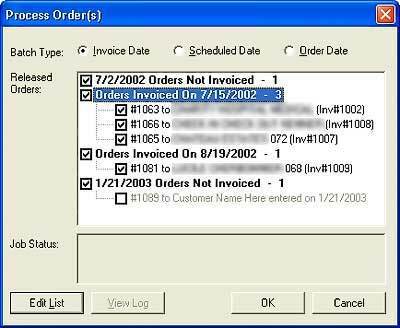 Collects inventory items into open orders for customers set up in accounts receivables; saves these, then receives shipment information, prints invoices and other documents, and processes the results into accounts-receivable invoices and inventory sale transactions. Best of both: Batch processing for efficiency and accuracy; selectivity to make it easy to process single orders. 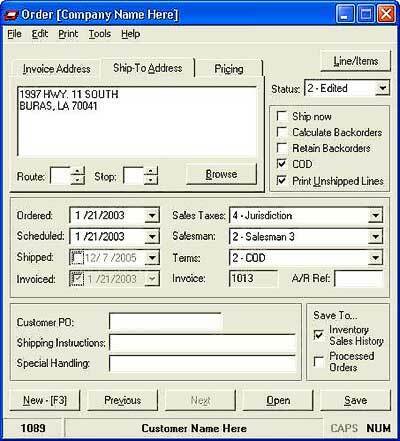 This is the window you use for entering shipped quantities and other editing of order lines. Note that the columns are arranged about like an invoice. Editing the order is as easy as changing the cells of a spreadsheet. As you change quantities or amounts, all the extensions appear instantly. Here's the window in which you work with order-wide information, such as the addresses, discounts, sales taxes, and so on. Both of these windows are open as you work with orders; you can switch back and forth, depending on what you need to do. 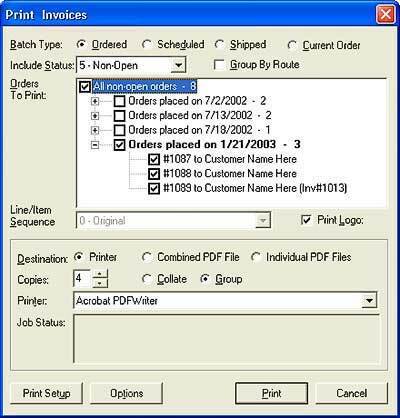 When you print invoices, the default settings are to print all those that haven't been. But, you can easily just check off the ones you want. And, you can click radio buttons at the top of the window to change the way it groups orders. 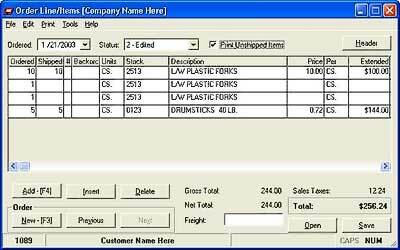 You can also press a key combination from either of the main order-editing windows (see above) to print an invoice for that order. The window from which you process orders includes the same flexibility. Again, it defaults to processing all the invoiced orders. Just click OK if that's what you want to do. Or, check off the invoices you want to process. It's as simple as that. 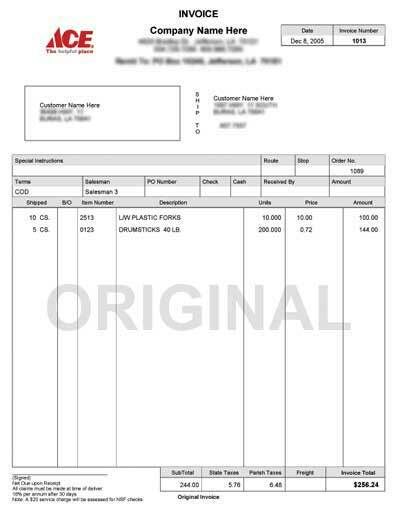 Here's a sample of a printed invoice. 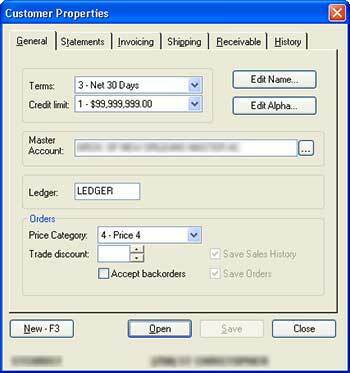 Our Order-Processing application is the most custom of our general-purpose software. In fact, each is unique for each customer. (There is no single downloadable update for Orders on this site. If you select Help>Internet Support>Updates in one of our Orders applications, the download is unique for you.) This application is actually a template with an unlimited number of variations. On the other hand, if one customer comes up with a function that would apply to others, we automatically pass it on to them too. In this way, each customer gets the best of both: as much unique customization as they like -- and any ideas that arise in other installations.